By Sia in Internet. January 25, 2017 . One of the more common ways to motivate someone to work is by annoying them to do so. Such is the logic behind Nagbot, an online service that sends nagging messages to your phone to remind you of tasks. Using Nagbot is relatively straightforward. You enter your name, phone number and a task that you wish to accomplish. Once you have those sorted, choose the time and frequency in which you would like Nagbot to gently remind you of your tasks and you’ll start receiving messages from the service. Apart from sending nagging reminders to your phone number, Nagbot can also be used to track your progress on the corresponding task. 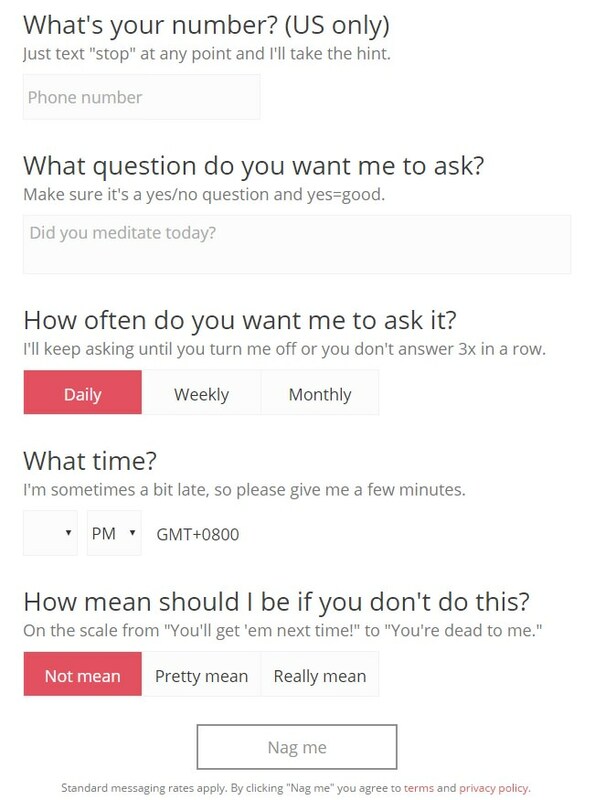 If you need extra motivation, Nagbot can also be set to give one of three types of responses depending on your reply to the messages, ranging from encouraging to antagonizing. Unfortunately, as Nagbot only accepts U.S. phone numbers, those living outside of the U.S. will be unable to use this service.